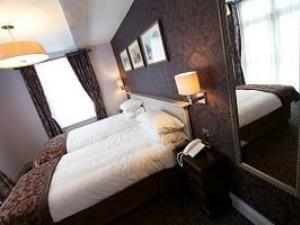 Punch House Hotel01600 713855work InnThe Punch House is a Grade II listed building situated in Agincourt Square. Officially called the Punch House in 1896, it was initially a coaching inn called The Wine Vaults and records indicate that the pub was in existence as far back as 1769. In keeping with our history, we offer a traditional pub experience with a great range of drinks and a menu of pub classics. If its relaxation and a catch up with friends then you’ll feel right at home with us, and with 11 en-suite bedrooms you will never want to leave. If you’re looking for a relaxing night’s stay in the heart of Monmouth, our eleven en-suite bedrooms are all designed for the perfect break. Our lovely accommodation still retains many of its original features and unique décor such as wooden beams, alongside modern facilities including tea and coffee making facilities, free wi-fi and TV. The Punch House is a Grade II listed building situated in Agincourt Square. Officially called the Punch House in 1896, it was initially a coaching inn called The Wine Vaults and records indicate that the pub was in existence as far back as 1769. Located in the centre of Monmouth, there are plenty of things to see and do when you are visiting the Punch House. Some of our favourites include; wine tasting at Ancre Hill Estate winery, a round of golf at The Celtic Manor Resort, watching an action-packed performance at the Savoy Theatre and walking up Kymin hill and taking in the beautiful views of the Black Mountains. Dogs accepted in selected rooms and the bar area, but there will be a supplemental charge per dog if staying with us. Children welcome from any age. Nearest train station at Chepstow and Abergavenny 14 miles away. Bus stops at local station 1 minute walk away.